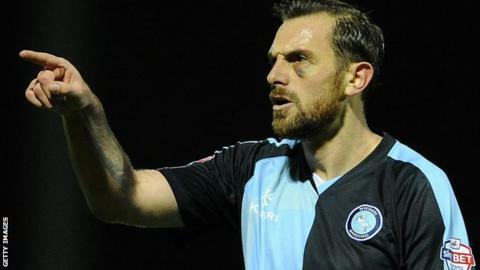 Wycombe returned to the League Two play-off places with a comfortable win over managerless Luton. Luton striker Paul Benson had the best chance of a lively first half but his header from Craig Mackail-Smith's cross went just wide. The visitors took the lead shortly after the break as Garry Thompson rounded keeper Mark Tyler to slot home. Paul Hayes sealed the victory for Wycombe with a neat header from Thompson's cross. Match ends, Luton Town 0, Wycombe Wanderers 2. Second Half ends, Luton Town 0, Wycombe Wanderers 2. Attempt missed. Cameron McGeehan (Luton Town) right footed shot from outside the box misses to the right from a direct free kick. Jack Marriott (Luton Town) wins a free kick in the attacking half. Substitution, Wycombe Wanderers. Stephen McGinn replaces Matt Bloomfield because of an injury. Delay in match Matt Bloomfield (Wycombe Wanderers) because of an injury. Attempt blocked. Michael Harriman (Wycombe Wanderers) right footed shot from outside the box is blocked. Attempt missed. Josh McQuoid (Luton Town) header from very close range is close, but misses to the left. Attempt missed. Garry Thompson (Wycombe Wanderers) right footed shot from outside the box is close, but misses the top right corner. Sean Long (Luton Town) wins a free kick on the left wing. Foul by Garry Thompson (Wycombe Wanderers). Magnus Okuonghae (Luton Town) wins a free kick in the attacking half. Substitution, Wycombe Wanderers. Max Kretzschmar replaces Paul Hayes. Josh McQuoid (Luton Town) wins a free kick on the right wing. Luke O'Nien (Wycombe Wanderers) wins a free kick on the right wing. Substitution, Luton Town. Luke Guttridge replaces Danny Green. Substitution, Luton Town. Jack Marriott replaces Paul Benson. Substitution, Luton Town. Josh McQuoid replaces Alex Lawless. Foul by Sean Long (Luton Town). Attempt missed. Craig Mackail-Smith (Luton Town) right footed shot from outside the box is close, but misses to the left.